Dauntless is a co-op, action RPG coming to PC in 2017. More details about other resolutions, performance benchmarks, and graphics settings to follow at a later date. Last edited by Pyre; 04-02-2017 at 09:23 AM.. The bad thing is that they went ahead with pay to win founder's pack. Probably a cash grab to finance early development. Hopefully no other such pay to win options that affect loot drops either in "quanity" or chance is added to its in-game store. It will split player base and worse of all, signify a willingness to modify loot drop chance and quantity on the fly or sly...( Punish free to play players so they pay and punish paying players so they continue to pay once their bonus is up). yeah we have a few players with Founders access. do note - still Alpha. expect bugs. issues. death by lag. Last edited by Pyre; 19-08-2017 at 10:33 AM.. Thank you to everyone who has helped us test the Founder’s Alpha; we are working on a patch and hope to release it on August 19th. Sometimes framerate can be lower in the city, especially when graphic settings are turned up and the city is heavily populated. Solution: We are working to fix this and in the meantime try lowering your graphic settings. Content will not appear in-game if the player is logged in when redeeming a code. Solution: After redeeming a code at https://playdauntless.com/accounts/my-account, log out and log back into the game. Go to the Core Breaker to find your new core. Partner Streamer Cores do not appear at the Core Breaker initially. Solution: Leave the Core Breaker and return to see the content refresh. The game camera may encounter issues if the Intro Video is paused when starting for the first time. Sharing your account with another player can lead to crashes and instability, as well as corrupted data in inventory. Solution: Do not share account credentials with others, your Dauntless account should only be used by you. Servers may occasionally stall, resulting in a hanging loading screen. Solution: Please wait 5 minutes to allow the server to attempt to recover. If after 5 minutes the server has not recovered, please log out and log back into the game. Solution: Please log out and log back in and try again. Solution: Kill that silly Behemoth, it had it coming. Sometimes chat messaged are not received. Solution: We’re working on a solution, in the meantime please try re-sending your messages. Solution: Stay tuned. Exciting updates are on the way! UPDATE - We are working around the clock to include additional fixes based on community feedback. The patch will release today. Servers will go down during this time and all Slayers will be disconnected. You will then receive this patch. Resolves an issue causing a resource indicator (leaf symbol) to always be displayed. We have hired someone to point a leaf blower at the server. The character creator will now be more clear that you are committing to a character appearance. In the future, we will allow for character appearance changes. Fixed an issue where some Behemoth part breaks and severs were not dropping properly from hunts. Dauntless accounts will be migrating to the Epic Games store this year. 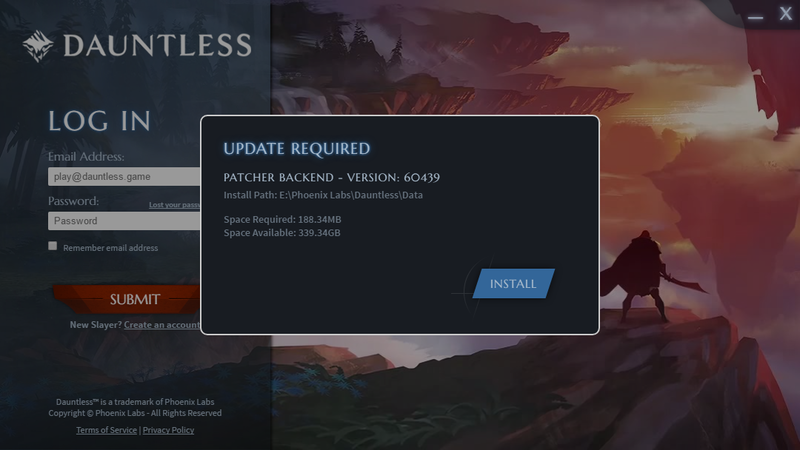 The current Dauntless patcher will be retired after all accounts are migrated. You will use your new Epic Games account to log in to Dauntless in the future.